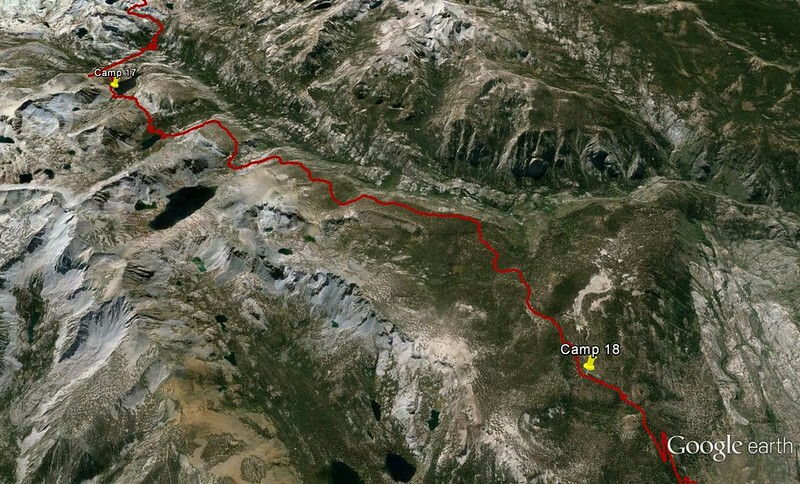 JMT, Day 18: Making Miles – Hi, Alpine. We sleep in on our sunny platform above Lake Virginia. Birds are chirping! Squirrels are scurrying! My back’s on bare ground! Wait, what? My back’s on bare ground? I guess my pad must have deflated at some point in the night? I guess there’s a puncture? Ugh. Only a few days left though, yea? I can sleep on the ground for a few days if need be. We walk down do the lake for breakfast, splash our feet while our water boils. There’s a group across the lake laughing, some guy with a strong Russian accent yelling happily as he lifts his tent – the same model as ours – above his head and shakes it out. It’s hilarious and he knows it’s hilarious and ducks are swimming across the water, maybe laughing too. The world’s laughing. The sun shines on the water, reflecting toward the horizon, as it blends with the gleaming white granite. The lake looks like an ocean. A few groups pass as we’re getting packed up – just starting out, nervous about the smoke. Today’s mostly about making our miles. We meander around the lake, across a few beautiful outlet streams, and up toward the pass that separates Lake Virginia from Purple Lake. I’m weirdly tired, and I put on some Andrew W.K. TRAIL PARTY! It becomes my sort of soundtrack for the day. I turn my music up and rock it all the way down to Purple Lake, through thin, hot, dusty forest. We pass maybe half a dozen bros on their way up, sweating in their jeans. Weekenders out of Mammoth. Wait, is it the weekend? I try very hard, and fail, to remember what day it is. Party tip: when you do what you love, every day is Saturday. 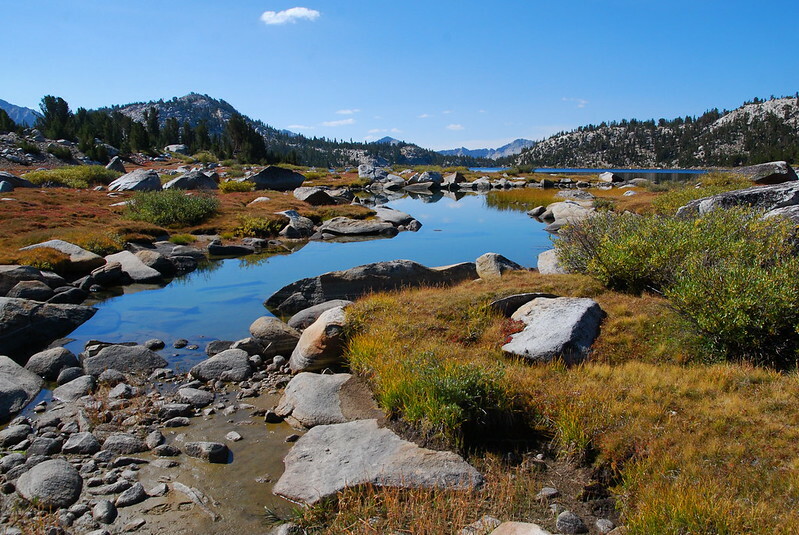 Purple Lake’s a little over-loved – bare spots everywhere, ashy fire rings, tiny pieces of Mountain House packages in the grass. But it’s also empty, so we stop on the shore for second breakfast. I think for neither the first nor the last time: anywhere else, this would be a highlight of the trip. 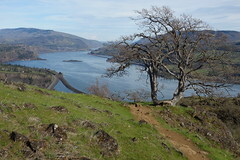 It would be the place we hiked all day to see. But here it’s just a short stop on the way to somewhere else. 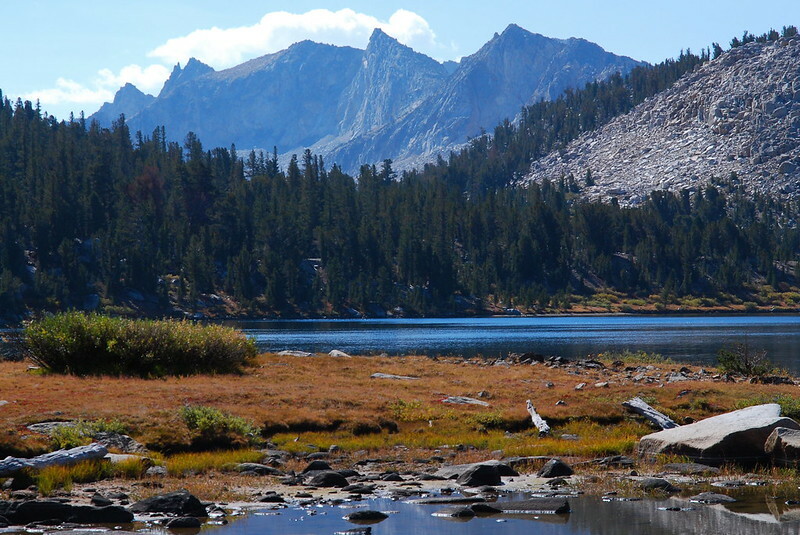 From Purple Lake, the trail enters some drab forest, though there are nice views, once more, south to the Silver Divide. Stopped on the side of a dusty hill, sitting on a rock above the roots of an old dead tree, I think about the central strangeness of thru-hiking. We’re here, in the middle of everything, but we’re also always passing through. What we see, we’re seeing simultaneously for the first and last time. 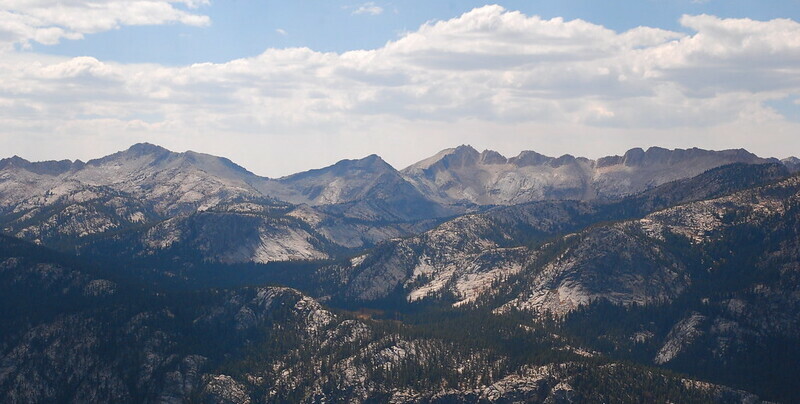 I stare back at the Silver Divide for a long time, then close my eyes, trying to make a memory. 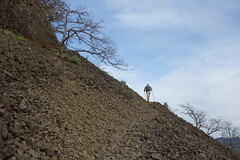 The trail rolls and ripples along the side of a steep hill, all dust and uneven rock. It’s dry here, drier than anywhere we’ve been since our first day. We stop for lunch at Duck Creek – a thin trickle that’s the last water for five or six miles – and Krista makes Alpine Taco Bell: equal parts freeze dried beans, taco seasoning, and olive oil. Dude I love Alpine Taco Bell! And dried mango! We dip the mango in the beans. Krista claims it’s like mango salsa. I think it’s probably been too long since we’ve had real food. The trail after lunch is a broad, easy path through thin, nondescript forest. No understory, no brush, not even a fallen limb. 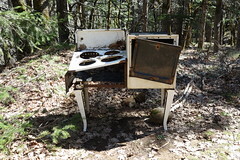 It’s campground clean and kinda boring. I put my head down, put that album on again, and we make our miles. Six in an hour and a half, down to Deer Creek. At the creek, someone’s set up a massive camp, with a rope extending ten feet between trees, covered in wet clothes. It’s like someone’s settling in for the winter. A stocky man in a football jersey limps out of a three person tent, and asks me how it’s going. He and his buddy hiked out of Mammoth today, maybe seven miles. 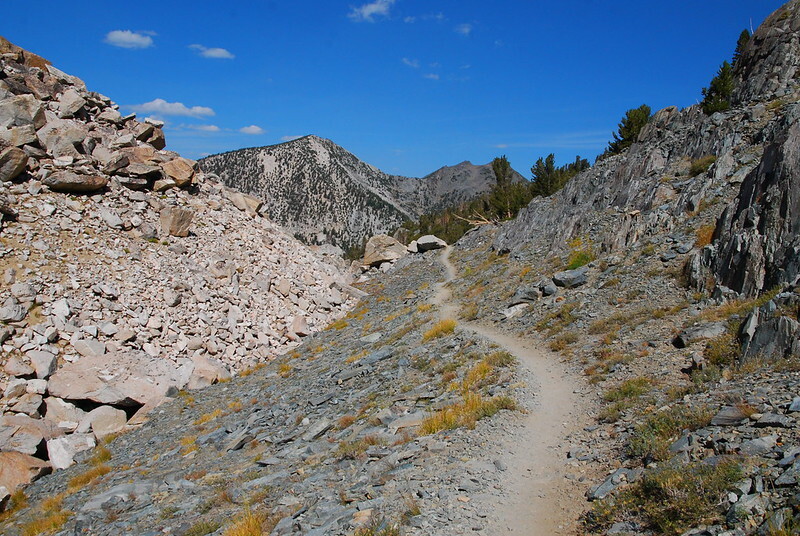 They’re hoping to walk the trail south to Bishop Pass, but they’re not sure. It’s just their first day, and they’re already exhausted. I tell him about my imaginary bears at Chicken Spring Lake, how it gets better. But then there’s something else: “I’ve got a wife and a kid at home, waiting for me.” I don’t have an answer to this, and so look down at the ground for a second, but am saved by Krista, who comes bopping over the Deer Creek Bridge at the exact right moment. I can tell by the way she’s walking that she’s listening to Erasure or something. 80s pop. I just want to hug her, but instead smile weakly at the man as she joins us. I wish him luck, then Krista and I go off together. Party tip: marry your best friend. The sun sets for an hour as we walk the last little bit to camp. There’s water now, flowing out of stumps and fallen leaves, and the forest is suddenly thick with thin new trees. We stop at Upper Crater Meadow, a small forested camp along Crater Creek, where we cook, sitting in the dirt, to the sound of water cascading through smooth rocks. A couple deer meander around the the hill above our camp. I stare until it’s too dark to see.